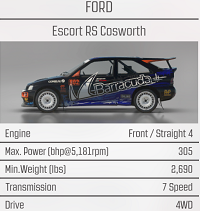 Welcome DSRL members to the inaugural DSRL Rally Championship! Our first FULL competitive championship with the sim title Dirt Rally for Xbox one. Season 1 will be a tough and enduring test for all entries, with a one week long rally going all the way up until the release of Dirt 4 in early June. 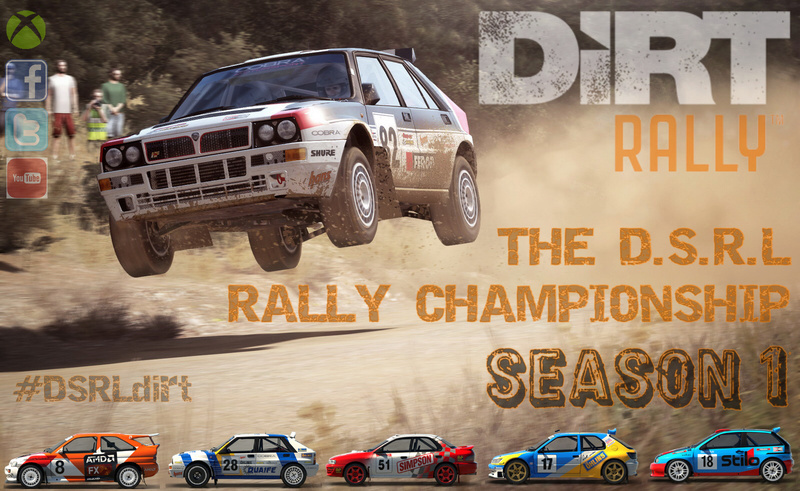 In season 1 of the DSRL RC, we will be visiting all stages and locations currently available in the game. Each rally will last a full week with 12 stages of different lengths, speeds and altitudes.The first event will start in January on the extremely tight roads of Monte Carlo, Monaco... so there's plenty of time to get to grips with your preferred car of choice and the unforgiving brutality of Dirt Rally. 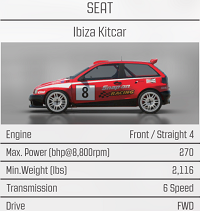 Season 1 will feature two types of classes you can choose between running in, a Group A 4WD class and an F2 Kitcar 2WD class. *Owned vehicles will be off for the remainder of the season to increase participation. 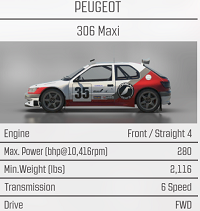 We have picked these classes as the prices for buying these cars in game are quite cheap and more accessible for new players after a few career events. Once you have bought a car, get some practice miles under your belt and develop the full upgrades as you grow more comfortable with it. We also ask that you pick a livery preference (although limited) for your car just so that you can be more easily identified in pictures and rally review clips. Car/class choice is open to change until the season starts, once round 1 begins all choices are final. There will be a Drivers championship in each class for season 1 of the DSRL RC as well as an overall team championship. Teams are optional but must include 2 drivers that are signed up in the same car. Team drivers must also use the same livery choice. Overall rally results will be provided in the standings table but all championship points will be separated between 4WD and 2WD entries due to various performance differences. We aim to fully simulate the harsh realities of rallying in this championship, pinning the focus on surviving each event, getting through the stages carefully and making it out the other side in one piece. This opens the chances up to everyone involved & not just those who can torpedo a single stage & restart without any consequences. Your rally can be over in a split second and that comes down to the way you approach the driving on each special stage. There will be a maximum of just 4 checkpoints at every 12 stage event mainly to minimize unsporting behaviour and also to encourage more careful driving. These occasional save points will allow you to take a quick break if needed, or to complete the rally over the course of a few days. Save points will only occur at service areas. Every round of the DSRL RC will be open for 7 days, with at least a week long gap until the next scheduled rally, so there's plenty of time to weld up that chassis and rebuild those arm muscles! 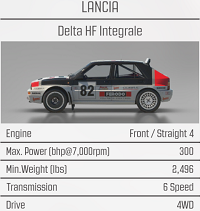 Fun and unique combinations will still be separately available regularly in "the DSRL rally" league whenever there is a break in the schedule, however that league will not be hosting any of the championship events. Each rally will begin on Friday night and work through a simulated weekend with appropriate time progression over the course of all 12 stages. 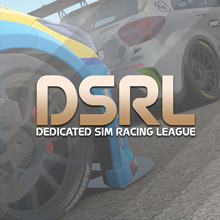 Season 1 of the DSRL RC will also feature real world weather (when applicable in game conditions) determined by weather forecasts of that location for the weekend of the scheduled event start. This will be finalized and announced 1 week before the rally opens in order to get the weather implemented into each stage appropriately ahead of time. The frequency of service areas in season 1 will be dependent on the rally and layout of stages, this will be specifically outlined in each individual event thread along with stage order as it is announced. *The championship will be hosted and organized through Codemaster's Racenet, so an active account is required to enter. The sign up for This account should have been created when you first played the game and it can be accessed through the Xbox browser under the "leagues" tab. It is advised you become familiar with navigating the site and league area if you haven't looked at it yet. *There will be an extra 30 minute window added to each 7 day rally for result overview and final standings confirmation, during this time no new finishing leaderboard times will be accepted into the results as they must all be submitted during the 1 week time-frame permitted before the added 30 minute window. *As there is no way of the league hosts directly controlling settings such as assists, views, HUD etc. these will be down to player personal preference for season 1. *We expect sign ups to participate in all scheduled rallies as they are each going to be live for a whole week. If you know you are going to miss a scheduled event we would ask that you message a DSRL admin or organizer and let them know beforehand. *Organizers may be required to force a regulation change at any point in the season if there are unforeseen issues with the championship format, this is unlikely but will be made clear to all who sign up if it is necessary. *Take a screenshot of your final time on the leaderboard after finishing, this helps for time evidence backup if there are issues with racenet. *A Shakedown stage will follow each rally in preparation for the next round. This saves the times from the main first event and allows them to be viewed for an extended period. 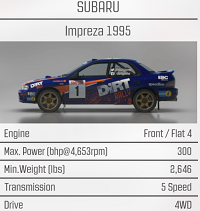 IMPORTANT: When you have complete the signup form, Search for "THE DSRL RC" on racenet or follow this link https://www.dirtgame.com/uk/leagues/league/66869/the-dsrl-rc and your request to join will be accepted once confirmed. The championship will NOT be run through "THE DSRL rally" so please join the correct league. Once on the dirt site, make sure the platform is set to Xbox one in the top right and that you are linked with your account by signing in with your gamertag. If you have any questions contact Mcduff79 or EpilepticToast. I have read and understand the rules: YEAH! Hey man, Welcome to the site! I think you might have misread the signup a little, you are only meant to choose a car in 1 of the 2 classes provided, not for both. If you could post whichever you would prefer of the 2 cars you put above, that would be great. I'll put you in as N/A for now. Nice to see you sign up micko! maybe you could see if Drizzle_180 would team with you as you both have the same livery preference posted for now... completely up to you guys. There will be livery duplicates regardless due to the limited amount on console so no big deal. Will update it now... Happy new year!